Learning or teaching music is one of the most wonderful activities of the world as it allows you to explore your own self and enhance your overall personality. Teaching children to sing can be quite an enjoyable task as it allows you to create music through young and beautiful voices. However, this can be an extremely challenging assignment at the same time because of a natural communication gap between children and adults. 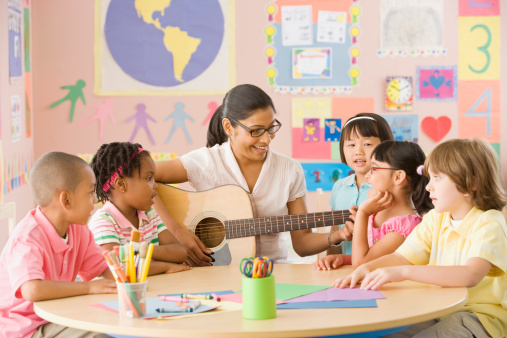 In order to make the children learn effectively, you would need catchy lyrics, lively music and contagious enthusiasm. On top of that, you have to be very patient because every child has his or her personal capacity to learn. In order to effectively teach singing to the kids, you must choose the right music, which should be able to attract the children. You need to ensure that the melody, lyrics and rhythm are not too complicated for them; otherwise, they are likely to lose interest. Children love group activities. It is recommended that you work with a group of kids who have a similar mental level and educational background. Before you ask them to sing, you should play the song you want the children to sing and make them listen with concentration. Make them familiar with the tone by playing the song multiple times. You can ask the children to sing with the tape. Having stopped the music, you should now say the lyric out loud and ask the children to repeat the phrases after you. In order to enhance the level of interest of the kids, you can clap rhythmically while singing. Ask the children to make a queue and then march in a circle while singing. However, you must ensure that the tempo and the rhythm are not broken. Once you have made the children familiar with the tone of the song through group activities, you should ask every children to come forward and sing the song, while the rest listen to him quietly. Apart from improving the singing abilities of the children, this exercise will make them more confident.